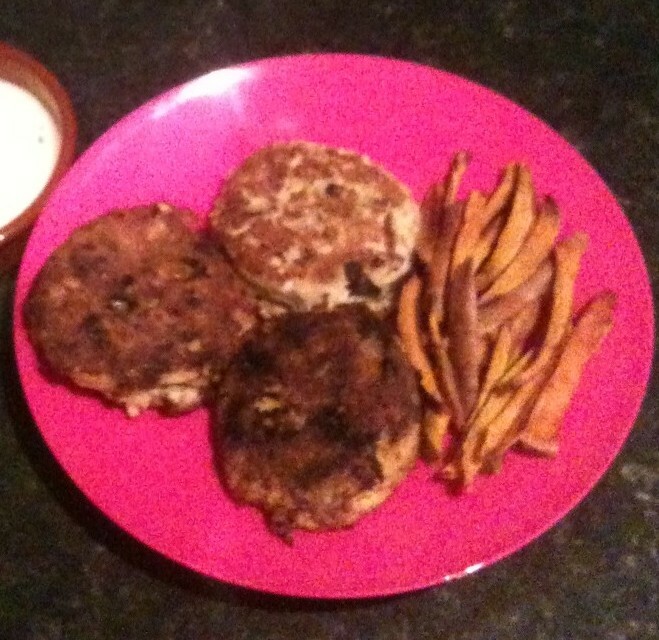 Fish cakes are a popular choice for supper that you may miss when you start eating Gluten Free. With this recipe for Gluten Free fishcakes, they are back on the menu. It is a really quick and easy recipe to follow and none of the ingredients are difficult to find anywhere in the UK. The recipe suggests using canned Salmon which tastes great as well as being really good for you with a high omega 3 content (tinned Salmon also contains more Calcium than fresh salmon). Salmon can however be a bit expensive although there are often special offers if you shop around a bit. I can’t see any reason why you couldn’t replace the salmon with another canned fish. I’d think Tuna would work well but experimentation is encouraged. Served with sweet potato fries and mayonnaise these make a great, quick, easy and healthy dinner. 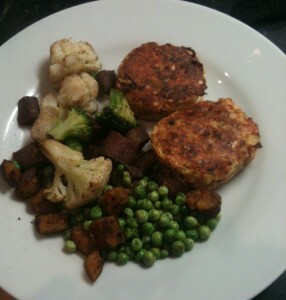 The fishcakes also go well with guacamole, mashed potatoes, roasted vegetables or a green salad. 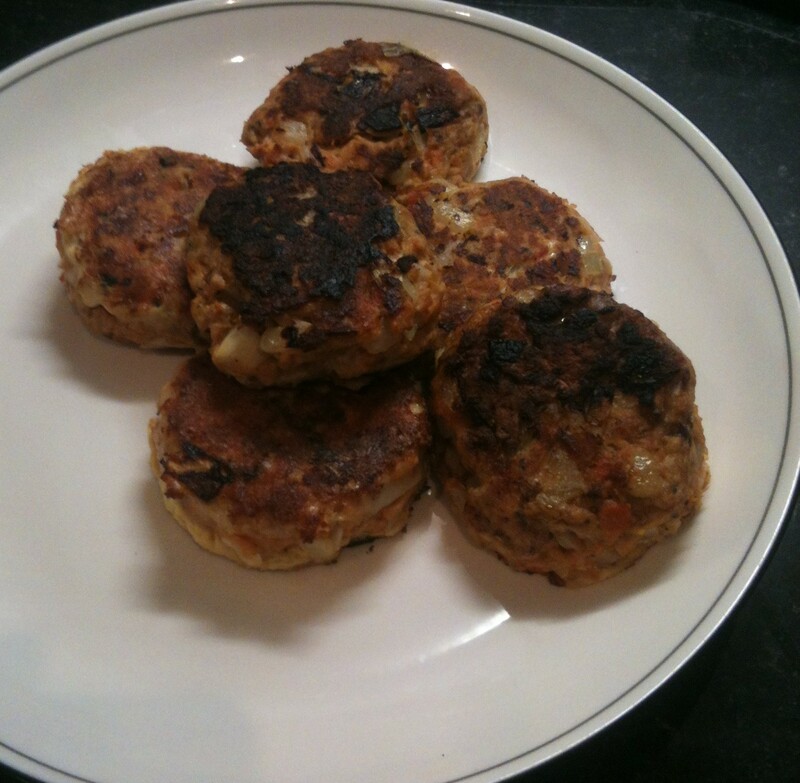 The amounts given in the recipe below will produce about 6 fishcakes, if you’re just cooking for yourself you can put them into an airtight container and then store them in the fridge and they will keep for 2 or 3 days. If your having people round you could make these and turkey burgers and serve them with a variety of dips and sides for a quick, impressive buffet that should have something for all but the fussiest of tastes. Break the eggs into a mixing bowl and quickly beat them together. Open the canned Salmon, drain off some of the liquid, check it for bones and remove any that you find and then add this to the eggs. Add the diced onion, parsley and some black pepper to taste. Thoroughly mix all of this together. Shape into about 6 or 7 burger shaped patties. Fry each patty for about 5 minutes on each side until they are crispy and golden brown. Article posted in Dinner, Recipes on September 28, 2013 by Ray Smith.